Look at this man. This is Edward. He is founder of the Barstarzz. I was lucky enough to interview him this morning (actually, it was deep evening in New York City). He trains exclusively with his own bodyweight. He is strong as he looks. He performs amazing feats of strength, agility, balance etc. How this man was able to build such an amazing physique exclusively with his bodyweight? Because calisthenics work. And he’s not the only one. Look at other BarStarzz’s athletes. They look AND perform totally awesome. It’s not genetics. It’s consistency and perseverance. These things build such great strength and such great bodies. I’m really sick and tired of people that say something like “Oh! I need gym membership to become strong and fit” or “Oh! I don’t have time to train”. Seriously? Forget your excuses and go train! How can you train with your own bodyweight, get superstrong and achieve such amazing body? Read on. Hi, Edward! How you doing? Tell us about BarStarzz. Hi, Alex. BarStarzz is a fitness organization that’s international. We’ve come together to push forward the idea that you can train your body, gain strength and definition, without ever stepping in a gym. Just at your local park or at home with very minimum equipment. And hopefully we just trying to spread the message to people through our videos. And now we are going through a stage where we’re showing ‘how to’. So we’re showing you what to eat now, what workouts to perform. Very interesting. What can you tell us about your workouts? I work out strictly through calisthenics so I really use no weight lifting, no traditional dumbbells, barbells. I wake up and I go to the park. So I do a lot of different pull-ups, push-ups, dips. I try a lot of different moves. I like to experiment with my creativity. Do as much as I can with all the equipment I have. Ok. And how would your typical workout look like? That’s hard to say because I switch my routines out daily. I always have different stuff to do. That’s why I can’t stick to one routine. You want to shock your body so your muscles will continue growing. And you don’t want to get bored of workouts. We always make up games, we try to beat each other’s score in pull-ups or would go back and forth with different tricks. But I never stick to one particular routine ’cause then I go crazy. I want to have the fun that I have from doing this. I have a long workout. So I would say I work out a good hour and a half to two hours. Sometimes even more. I get together with a group of friends and we go to a park. It’s usually afternoon. It’s the best time for me. We choose the workout routine once we get there, you know. Once I get there, I start thinking and whatever I’m in the mood to do that day we start to do it. Or someone else can take charge and they say what to do. So we all take charge giving our routines and we just try them. I train about 5-6 days a week. You have to build up to it. It took me awhile. When I first started working out, I worked out 1 day and 1 day off. Over time my body got more and more used to it and I made it to workouts 5-6 days in a row. I think it’s the most asked boring question, but anyway. Can you gain muscle mass with calisthenics? Yeah, you definitely can. I’m a big dude, you know. I’m not huge, but I have like about 17 inch (43.1 cm) arms or 18 inch (45.7 cm). Around there. A lot of people consider it big. And all I do is calisthenics. So you definitely can get big from calisthenics. Before I started working out I was real skinny and real small. Not anymore. Do you perform leg work? Yes. I do a lot of sprinting up and down stairs. I also perform a lot of pistols and jumping squats because I like to work on my explosive jump, so I’m doing a lot of plyometrics, when it comes to my legs, of course, using bodyweight. When you train your pull-ups, dips and push-ups do you prefer lots of volume or you pick more challenging variations? I do both. Like I said, I’m more into creativity, trying different stuff and mixing stuff together. So one day I do a lot of pull-ups and I go for numbers. And the next day, you know, I work on one-arm pull-ups or stuff that is harder and I won’t be able to do as much reps. But just to keep me entertained. What more can you say about calisthenics? I think a lot of people are confused when it comes to calisthenics and think that it’s the good way only to get ripped or it’s not as good as bodybuilding, or lifting weights, but it definitely worked a lot for me and a lot for other people. It’s a great thing, you know. You are able to workout and get a great work out paying nothing, you able to get just as big as the guys in the gym, if not stronger. 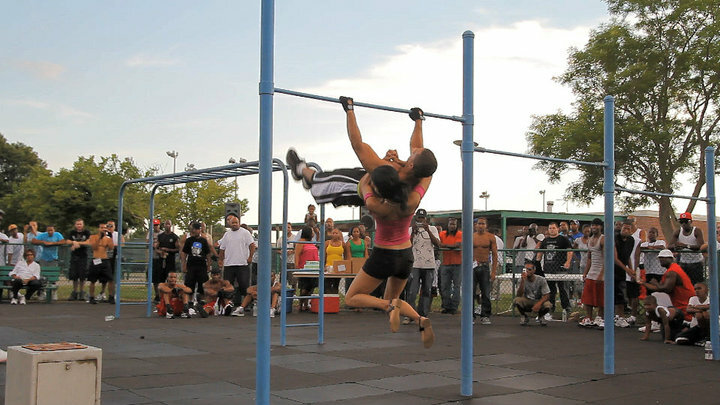 Because this stuff I’ve seen done in the park I’ve never seen done in the gym. Yeah! I’ve seen a lot of good squatters or good deadlifters, or good bench pressers that can’t even do a pull-up or a couple of push-ups. I’ve seen a lot of such guys. When I used to go to the gym, there used to be a lot of guys that are really big and they could bench a lot. You know, they could go heavy on the weights, but when it came to doing pull-ups they perform with bad form and reps of 5. I think the most important thing that you can do when it comes to fitness is to get acquainted with your bodyweight. You should be able to do everything with your bodyweight. Do you perform grip work? Just recently I started playing around with using two-finger pull-ups, finger push-ups and finger planches. But as far as actual gripping I don’t perform any gripping exercises. Yeah, I definitely practice a lot of gymnastic moves. But I don’t like to practice just plain gymnastic moves. I practice it, but I always like to add my own little twist to it. It wouldn’t be a regular back lever, it would be a back lever where I move my legs side-to-side or something, you know. I like to add my own little twist to everything I do. Have you experienced elbow tendonitis? I think everyone I know who trains with calisthenics experienced it at one point. You will experience it with time no matter what you’re doing. When you get it just relax the body part that hurts from it. And when you rest, ice it three times a day. Icing really helps. Remember to warm-up before working out and to stretch after. Doing these steps will prevent tendonitis or at least help to treat it better. Any interesting stuff about BarStarzz? We came on news couple of times. Right now we’re working on a DVD. We want to tell people exactly how to learn how to do a lot of different moves that we do, to speak on diet, to speak on a lot of different stuff that people unsure on fitness. We all come together to make this DVD. And now we are about to come out with a new YouTube channel on Spanish for all our Spanish followers. What countries do BarStarzz include? Right now it’s America, Bulgaria and Italy. But we’re looking forward to spreading it to more countries. The thing is, I like to be really involved with people that represent us. You gotta make sure that they are positive people and are spreading the same message. Ok. You’ve mentioned diet. What are your views on it? My diet: I don’t eat any diary or any grains for 6 days out of the week. And then one day of the week I eat whatever I want. So during the week I eat something like tuna, eggs, chicken, beans, natural peanut butter, a lot of different fruits and vegetables. That’s mostly what I eat during the week. A lot of eggs. And one day of the week I eat whatever I’m craving for. I try to get protein in every one of my meals throughout of the day. I eat between 4 to 5 times a day including snacks (fruit shakes or can of tuna). No, not at all. I don’t believe in counting calories. I think it’s more important the quality of the food that you’re eating. Your advice to Rough Strength followers? Start slow. You don’t want to get injured. You definitely need to master the basics as far as pull-ups, push-ups, dips, squats, crunches, knee raises. Stick to the basics until you feel real comfortable with it. And then start moving on to harder stuff and start experimenting what works best for you. Remember, everyone has a different body. What works for somebody might not work for you. That’s about it. Take your time. I just hope everyone gets a chance to check us out on YouTube, Facebook, Twitter and the website. Keep expecting the YouTube videos on tutorials. Let us know what you want, so we can get out videos for you. Be patient. DVD is on it’s way. Thank you, Alex, for the interview. Thanks, Edward. It was nice talking to you. Keep up with your stuff. Are you tired of lack of results? Strength training seems like rocket science to you? Do you want to get strong, build muscle, lose fat and get awesome finally? Let the professional do all the dirty work for you. Thanks. Everyone pursues individual goals. It’s great to be able to deadlift or squat great numbers. It’s sport-specifically great. But it don’t contradicts with the idea that everyone should master their own bodyweight. I’m a big believer that if you master your own bodyweight that strength WILL carry over to any sport and lifting weights specifically. Just look at oldtimers. They performed bodyweight movements and they lifted weights. One doesn’t exclude another. Every tool is different and feels different. But bodyweight is the most native tool for anybody. I just have already been seeking to be able to use this kind of motivational sports quotes designed for several years currently with pretty little good results. Can\’t wait to make an effort out your own guidelines. I\’m going to make an effort to bear in mind to come back as well as let you realize how they work out intended for me personally. In addition I want to ask my friend to arrive and read this good article. I’m not a part of BarStarzz and doing a bit different training but I’ll answer your questions. As for “what to start with?” Edward answered it in the interview. Start slow. Focus on basics: push-ups, pull-ups, squats and dips. Don’t worry about sets and reps. Just do the stuff every other day until you feel comfortable with them. Then you can progress to harder stuff. Thanks for commenting. Keep up with training. Pingback: Vegan and Calisthenics - Interview with Noel Polanco | RoughStrength.com - Gain Strength, Build Muscle, Lose Fat, Get Awesome! Thanks for this interview, very inspirational and learners, greetings from Poland !